Recently, I have spent most of my spare time on arduino, an open-source electronics prototyping platform. Arduino is very easy to use that one with little hardware knowledge like me could start making something quickly, and with various shields and sensors, it is also very powerful. Ok, let’s go to the main topic today, my first android arduino project. The reason for the small project is very tricky, that is, I usually doubt the weather and envrionmental info from official departments, especially for the PM 2.5, As a result I decided to build an environment sensor and take it with me every day. The data around me is the most accurate one, right? Above is how ardorid looks like, at the time of writing, I havn’t found a satisfying PM2.5 sensor, so you can only see two lines showing. android device (my Huawei Y300) will act as a collector, analyser and display of the envriomental data. arduino(openjumper mega2560, openjumper sensor shield v3, bluetooth adapter, dht11 sensor) will retrieve data and feed to the collector. For the beautiful dynamic chart, the framework is AChartEngine. 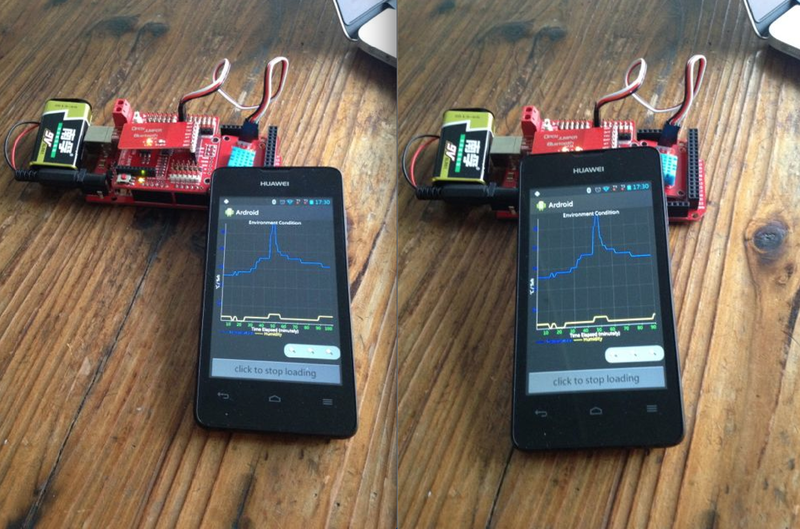 For communication between android and arduino, Firmata is your friend. Also, bluetooth is a nice choice besides google ADK board. OpenJumper sensor shield v3 makes the integration of bluetooth module, DHT11 sensor supper easy. Please refer to Github for the code. CharSequence message = "custom message"
There are several ways to implement email function in android, with their own pros and cons. I will try to summarize everything here, and you can find a demo application at the end. MimeType can be set to message/rfc822 instead of text/plain, to limit applications displayed in the chooser dialog. There is also an enhanced version, from which you can determine what will be displayed in the chooser dialog. (ported to android by Jon Simon). Firstly, you will need to download three jar files from https://code.google.com/p/javamail-android/ . Then, simply follow the code provided in the demo application, or you can refer to http://www.tutorialspoint.com/java/java_sending_email.htm for a comprehensive guide. Most applications have a backend service, it is easy to add an api that collects info from handsets and send mail on the server side. Automatic update of project.properties is disabled in intellij, thus the android library project cannot be added. Creating a new library module in android studio, for an ant based project, Studio only creates a settings.gradle, but forget to change the project.properties. So far, the root cause is clear, the inconsistency between ide settings and android configs. Use sub modules to manage third party plugins? A better place for facebook like and twitter buttons?